Florida law mandates that divorcing parties attempt to mediate all issues prior to trial. A good attorney will prepare you for the experience to improve your chances of a good outcome. If mediation fails, then the case may proceed toward trial. Divorce makes it extremely difficult to maintain a civil relationship with a spouse, which can carry over into the desired approach to litigate the divorce. 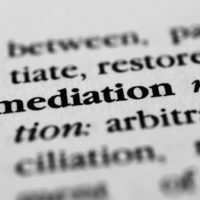 Litigation certainly has its place, and is necessary in certain instances, but there is another option that is both faster and less expensive – mediation. Finding a less contentious alternative to traditional litigation is often better for the couple in the long run, especially if they share a child. By approaching divorce in a more neutral atmosphere, releasing the negative emotions of divorce becomes a little easier, at least for the purpose of negotiating a settlement. Mediation is particularly popular among famous and wealthy couples because it allows for a more personalized solution to their issues, and maintains a degree of privacy that is lost once the courtroom is entered. Celebrity couple Jenna Dewan and Channing Tatum are currently engaged in a high-conflict child custody dispute they are attempting to resolve through family mediation. Since mediation is less familiar than a decision from a court for many couples, this process may seem hard to understand and not worth trying. However, it offers a number of benefits, not to mention that most family courts require divorcing couples to attempt a mediation settlement before moving the case forward. An overview of how the process works, and how it can be an effective alternative to litigation for some spouses, will follow below. The goal of mediation is to help a couple form an agreement on unresolved issues, which is difficult if one or both spouses have strong feelings about their position. To defuse this dynamic and help facilitate an agreement, a neutral mediator leads mediation sessions and tries to help the couple find points of compromise, as well as offering potential solutions of complicated matters. The mediator is not interested in one spouse winning, and can only lead a couple to agreement, but cannot force them to settle. Depending on the mediator and the needs of the couple, everyone may meet to discuss issues in one room, or the mediator can act as a go-between and have each spouse in separate area. If an agreement is not made, litigation will be necessary to complete the divorce. However, mediation does not mean a divorce attorney is unnecessary. Any settlement signed becomes binding, so spouses need an attorney involved to make sure they understand what the settlement means both legally and practically, and will help them structure their positions so a fair agreement is formed. One of the scary aspects of divorce for many spouses is the need to give control over to a judge about decisions that will affect the rest of their lives. Mediation avoids that uncertainty by allowing the couple to divide how property is divided, who gets the kids, and whether alimony will be paid. By taking the lead on these issues, spouses are much less likely to end up in court in the future over the terms of the settlement, and are generally more satisfied with the arrangement. In addition, the details of the marriage can remain private and not become public information, as happens with litigation. This privacy is often centrally important to couples dividing a business or dealing with complex child custody issues. A divorce attorney should be consulted about all the possible resolution options one may want to consider, because litigation is not always the best answer to the problems of divorce. Getting divorced means making a lot of critical decisions about how your life is going to look going forward. To ensure you have the clearest possible image of what to expect, talk to the attorneys at Baginski Brandt & Brandt to learn how divorce will impact you. The experience of our Port St. Lucie divorce attorneys can help you achieve your desired outcome, whether that includes mediation or litigation. Contact us at 772-466-0707 for a confidential consultation.